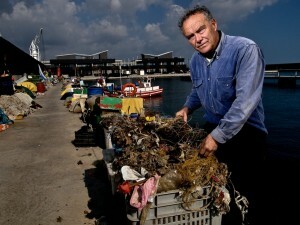 Ramon has his boat moored in the port near Badalona, I was photographing him as part of a story regarding the environment and pollution. He had an axe to grind about a few things, in the picture he is next to a crate full of the junk they dredge up in their nets, he has quite a collection of weird objects, the problem is exacerbated by the storm drains over flowing with heavy rain washing all sorts of unlikely stuff out to sea. He describes a large area just off the coast where the accumulation of plastics etc has killed off all vegetation. One of the biggest problems for the fishermen involves certain sanitary products that tangle with the webs and of course become turgid with water thus making the nets so heavy they become unusable. The other problem he has is with the local government and various construction loop holes that get abused so that building can take place, basically, on the beach, they in effect dam the sea forcing it back from the shore thus conveniently making the original beach fall outside of the minimum distance that construction can take place on.